An EU funded project that establishes a multidisciplinary research program to answer the urgent need to improve prevention for the control of diseases caused by Xylella fastidiosa. 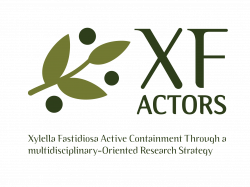 On 1 November 2016, XF-ACTORS project (Xylella Fastidiosa Active Containment Through a multidisciplinary-Oriented Research Strategy) formally started. Funded by the European Commission as part of the Horizon 2020 program, the international research project is the first in Europe entirely devoted to research on the bacterium Xylella fastidiosa, an important plant pathogen that causes several plant diseases. The project will be developed in four years with the participation of a consortium of 29 partners, coming from 14 countries worldwide, coordinated by the CNR- ISPP “Institute for Sustainable Plant Protection” of Bari (IT). The contribution of each partner is crucial for the success of the project for its effective implementation and to reach the proposed objectives. The Project Consortium is confident that this collaboration between research centres from all over the world, including prestigious Institutions from overseas with consolidated expertise on this topic, will lead the scientific research towards making many steps forward on Xylella fastidiosa. The actions foreseen for the XF-ACTORS project will be complementary to those carried out under Project POnTE (Pest Organism Threatening Europe), European project that focuses on minimising the risks of the introduction/impact of emerging pests (including Xylella Fastidiosa) threatening EU agriculture and forestry. The Ponte project is lead by CNR of Bari and it has been active since 2015.